Nasal congestion is the most feared and stubborn infection to avoid. Blockage or swelling of the nasal passages due to the lining of membranes caused by inflamed blood vessels is called as Nasal congestion. This condition obstructs the free flow of air from the nose. The symptoms of Nasal congestion and sinus pressure are nasal discharge, sinus pain, cough and congestion, head ache, bad breathe, fever, loss of smell and swollen nasal tissue. Most people with sinus infection face this congestion, which makes it hard for them to breathe. Long usage of medical sprays and drops can worsen this condition. 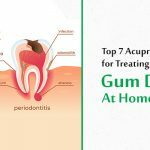 Though there are many painful treatments to clear up nasal congestion, acupuncture has some simple methods to help relieve sinus congestion naturally. To cure nasal congestion, you don’t need to use medical equipments, just use the right pressure points. Check out these best pressure points to cure sinus congestion faster. Warm your hands by rubbing them together. Now with the palm of your right hand rub the tip of your nose. Use a circular motion to warm the nose, do this 20 times. Repeat the same in the opposite direction. If you are suffering with stuffy nose, sinus congestion or nasal blockage, repeat this procedure at least 5 times a day. This will not only reduce the congestion but also works as a preventative from further blockage. For sinus problem and severe pain, use this technique. Hold the joint between thumb and the index finger, press is hard. Hold it in this position for two minutes. This will reduce the irritation and pain in the nose. Point to be noted: Pregnant women should not press this point as its stimulation is said to cause premature contractions in the uterus. 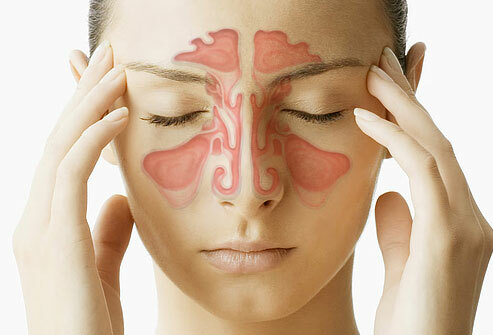 The joint near the bridge of the nose and eye socket is the area most affected with nasal congestion. Press both the areas near the eye sockets with the tips of your thumbs for 5 minutes. You can work on both these pressure points separately (one after another). However pressing these points together creates more pressure. If the pressure is applied properly you will get rid of the mucus in no time. You will also feel relieved from the pain and congestion. Place your index fingers on the edge of both the nostrils; you can feel your cheek bone. This is the pressure point most commonly used in acupuncture to cure sinus congestion. Press this point with pressure for at least 4 minutes. Repeat this process several times. If it is properly pressed, it begins to flush out the blockage giving you a free flow of air in the nostrils. Hold your head in your hands. Place your thumbs right behind your ears. Feel your skull with the thumbs and come to the base of it. Now your thumbs should be behind your ears and at the base of the skull. Press these two pressure points deeply and rub them for two minutes. Continue this process daily to reduce and prevent nasal congestion, cold and head ache. On the back of your head where the neck and head are joined, you will find a large hollow space. Point A marked in the given image. Place your middle finger on it and apply pressure for 4 minutes. Observe the changes that occur in your nose. Along with curing nasal congestion it also helps to reduce headaches and mental stress. Place your middle finger in the hollow areas below the collar bones and above the upper breast bone. 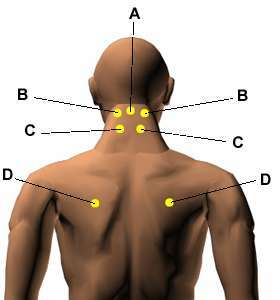 Press these pressure points for 5 minutes to prevent sinus infection and to boost your immune system. 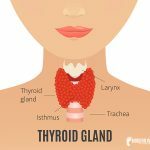 These points and techniques are not laid down only for people suffering from nasal congestion. They can be used by others who would like to prevent being victims of flu, cold, hay fever and sinus. Flu is very dangerous and many have been affected by it. Anyone can be a victim, old people, babies and even teenagers. As heard before, prevention is better than cure. Acupuncture can make a big difference to your life if you practice it properly. 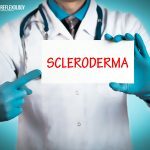 The body is very sensitive and the bacteria that enter into it can be very dangerous. The anti-bodies present inside, try to prevent the body from diseases. Early precautions and care can make all the difference. Whenever your hands are free try to put these techniques to practice and avoid sinus congestion. Acupressure is a very good technique. I have tried it several times and it gives me immense relief. My 8 year old son is seriously suffering from allergic symptoms which generally triggers when he is about to sleep. He will have severe itching in nose, eyes and the nose passage will block. Since years we are spending sleepless nights. We have tried several allergy medicines and nasal sprays which i feel stops working after few doses are taken regularly. I am really worried for his sufferings and could not bare his pain. I will be highly obliged for your help. Activate the following points- 1. In the hollow below the collarbone next to the breastbone. 2. On the top, outer end of the elbow crease. 3. Two finger widths directly below the belly button.Four finger widths below the kneecap on the outside of the leg.4. On the top of the foot in the valley between the big toe and the second toe. Stimulating these points will help you to get rid of allergies. Great and informative and useful article. I tried some of these acupressure methods after reading and got relief….God bless you ! thank you for the information. I’m pregnant and congested all the time and having trouble sleeping. I hope these tips help. Thank you for these. I had such bad congestion that not even a sinus rinse would pass. No kidding that 10 minutes after doing these techniques, I passed a large mucus and was able to breathe again! Miraculous! I’ve been suffering from a sinus headache for two days now. These tips are making a tremendous difference. Thank you for sharing them. Your information is very useful and informative. My daughter gets a sore throat almost every month. 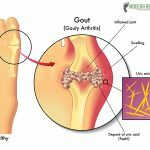 Which acupressure points can you advise me to use that would really take care of this problem. Thanks! Thank good help god bless you with this information. 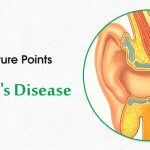 https://www.modernreflexology.com/curing-nasal-congestion-with-acupressure-points/ Follow this article for some respite. I feel some mucus (balgam) continuously flowing through my throat ….it is called najla in hindi …what can I do to cure this ? Two useful acupressure points for clearing excess phlegm are Liv3, a liver point, and K27, a kidney point, . Liv3 sits on each foot, between the bones of the big toe and second toe, where they join the foot. Use your thumb to push into the space between these bones, pressing down and toward the ankle. Feel for a tender spot. Massage and hold the point with firm pressure until it is no longer painful. Do both sides, then move to K27. 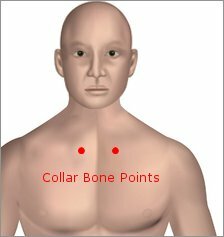 Follow your collarbone in toward the center, where it joins the breastbone. K27 rests in the hollow underneath the collarbone. Raise your shoulder to make the collarbone protrude if you can’t find the hollow. Massage, then press and hold the less tender side, then work on the more tender side, until the point no longer feels sore.